BROCKTON, Mass. - For the second straight year, the Whitman-Hanson Panthers are headed back to the Division 2 South Sectional title game. Last season it came courtesy of a 56-40 win against Foxboro. This time around, W-H held Westwood to 23 first-half points, en route to a 51-48 victory Wednesday evening at Staff Gymnasium in Brockton. Though many of the faces have changed (W-H graduated eight seniors, including its entire starting five from last season), the one constant remaining is defense and leadership. Senior captain Luke Tamulevich sliced to the hoop and laid it home to push the third-seeded Panthers (18-3) ahead, 4-3, 2:42 into the opening frame, and W-H never looked back as it was able to hold off a fierce fourth-quarter Westwood comeback. "It's actually surreal," W-H head coach Bob Rodgers said. "Nobody gave these guys a chance to even make the tournament when the season started. When we walked out of the [TD] Garden last year, if I'm really honest, I'm kind of thinking it's going to be a while before you have a chance to taste something like this again." W-H advances to face fifth-seeded O'Bryant (18-6), which defeated Falmouth 80-57 Wednesday, on Saturday at 4 p.m. at Staff Gymnasium. With 5.9 seconds remaining, Tamulevich came up short on the front end of a 1-and-1, giving second-seeded Westwood (20-4) one last breath. Unfortunately for Westwood, the Panthers defense continued to be a thorn in its side all game - forcing an erred shot with time expiring to squash the Wolverines rally. "The reality of it is, our identity all year has been our defense" Rodgers said. "I think if you ask Westwood, they're probably going to tell you that was one of the best defensive teams they've played all year." W-H, which has been effective at shooting from beyond the arc all season, went 0 for 3 in the first quarter. "They're so well coached," Rodgers said of Westwood. "They remind me a lot of our team last year that made it to the Sectional final. A very experienced team, a team that plays together." Fortunately for the Panthers, Tamulevich came to play early on and pumped in 10 points through the first eight minutes to help the Panthers take a 14-13 lead. "Luke is a special player, he's very dynamic," Rodgers said. "He can get to the hole, he can shoot it, he's one of those guys." Sean Leahy started to open things up for W-H down low in the second quarter - netting eight points - with four coming off a pair of offensive rebounds and put backs as the Panthers took a 30-23 lead into the break. "When you move the ball like we did and exploit switches, the mismatches we had, they switch every screen and it presented a lot of mismatches for us and we were able to take advantage of it," Rodgers said. 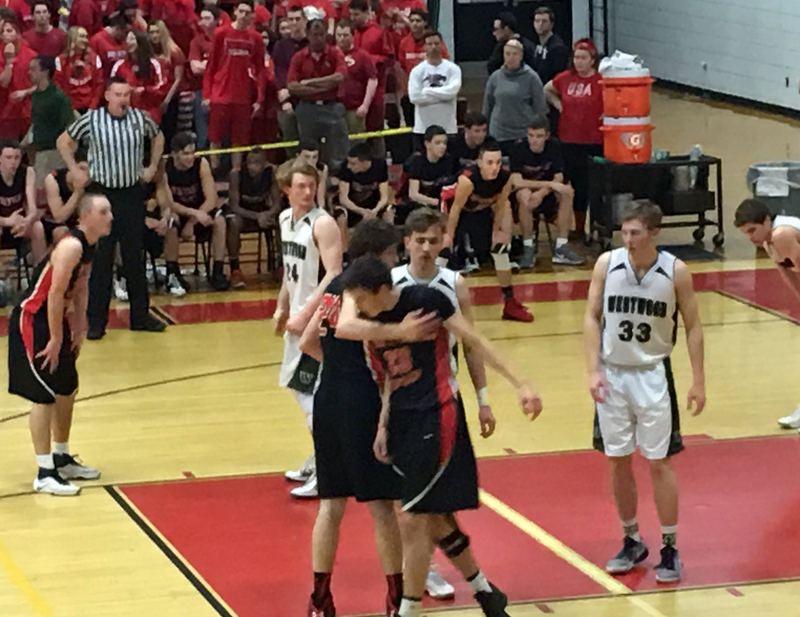 After being forced into nine turnovers in the first half, Westwood began to settle down to open the third quarter. With 5:48 remaining in frame, the Wolverines trimmed the W-H lead to 32-29, but the Panthers would answer. A 10-3 run - spanning 5:26 - shot W-H ahead by its largest margin of the game at 10, 42-32. The run was keyed by the Panthers’ first and second 3-pointers of the game. Westwood, behind the stroke of Tim Giovino, would not go away. Back-to-back treys by the senior guard brought the Wolverines within, four, their closest margin of the quarter, 50-46. After a Westwood miss, the Panthers' Nikko Raftes was sent to the line, where he connected on one of two free throws to extend the W-H lead to 51-46. With 5.9 seconds to go, Westwood's Sean Linehan drove to the hoop and drew a foul and connected on his first two points of the contest to make it a one-possession game, setting up the wild ending. Aidan Fitzgibbons and Giovino led the Wolverines with 12 points apiece and Reed Wilson chipped in eight points and six boards. For the Panthers, Tamulevich led all scorers with 18 points, Raftes added 10 and Hanson-Bartlett (eight points, seven rebounds) and Leahy (10 points, nine rebounds) combined for 18 points and 16 rebounds.